Are you a practicing Catholic who fully accepts the divine truth transmitted by the Church, who likes to write, and who feels called by God to evangelize and share your experiences of the Catholic life and what the Church has to offer with the world? 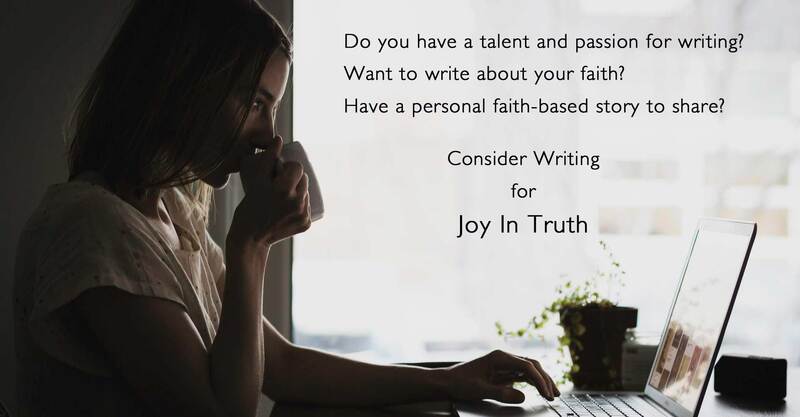 If so, consider becoming a contributing writer for Joy In Truth. What kind of writing style is Joy In Truth looking for? You can read through some published posts to get an idea of the tone of Joy In Truth. Take a look at posts from different contributing authors. There’s lots of room to write about God and your personal journey or, on the other hand, in a more academic voice. It’s often the case that people today are interested in personal stories written in a conversational tone that they can easily identify with. The divine faith of the Church relates to all aspects of marriage, family, culture, society and human living. There is a vast number of topics to write about. Writers are practicing Catholics in full communion with the Church. Articles/essays submitted cannot conflict with the divine faith and teaching of the Church. Posts may be written on a wide range of appropriate subjects which relate in some way to the life of faith. Most articles should fall in the range of 700 to 1600 words. They can be longer, but it’s generally best to keep it short. If an author has an article previously published elsewhere, other than his or her personal website, it is necessary to obtain permission from that publisher before submitting an article to Joy In Truth. Along with the article submission, written permission for additional publishing from the original publisher is to be provided. Joy In Truth does not offer remuneration for articles published. Authors retain all rights to their articles and may publish them elsewhere simultaneously. Articles submitted to Joy In Truth will remain published on this website at the discretion of the editor. Joy In Truth reserves the right to refuse submitted articles due to objectionable content and/or theological concerns and to remove articles from the site at any time and at the sole discretion of the editor. Joy In Truth will publish an author’s bio, as well as links back to his or her personal blog or website in order to help provide advertising support for the author, provided such website does not include content contrary to the Catholic faith and/or objectionable material. If an author submits pictures to be used with an article, they should be 1920 wide x 1000 high pixels. The author MUST possess all copyrights to photos; if not, photos used must be in the public domain or creative commons, approved for sharing and modification even commercially, with a link provided for credit. If you agree to the above terms, please fill out the form below. Be sure to include your name and email address. Your personal information and email address will NEVER be shared publicly or sold to anyone.